showing the belly and grooming! 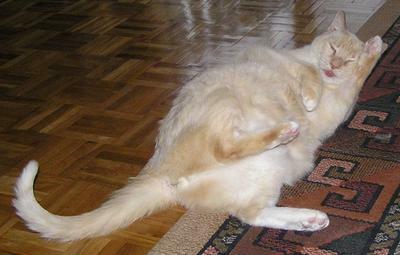 I found your site while considering the possibility of getting another cat of the same breed as my beloved Rascalbear: a flame-point Siamese. I find it interesting that there are a few other stories in here of people obtaining their flame-point Siamese cats by way of taking in a filthy, flea-bitten stray. My Rascalbear was also a stray, found as a kitten under a dumpster. Thinking him to be an unusual blue-eyed gray cat, he was brought home and given a bath, where it was discovered he was actually white and ginger beneath. I was not really in the market for a third cat in my small one-bedroom apartment, but as my other two cats did not eat him for lunch he was allowed to stay. 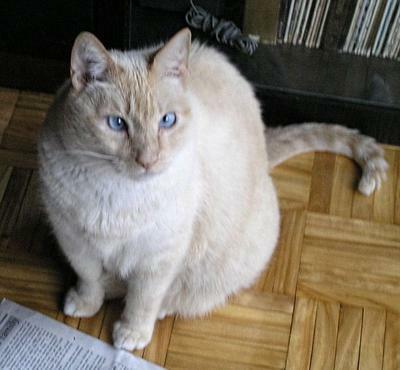 I could tell by his blue, crossed eyes that there was Siamese in him, but I discovered only years later that he was considered an actual breed called flame-point Siamese, with perhaps a touch of something else thrown in, based on his ginger body-striping and pure white left hind foot. Smart, playful, and very talkative - he could even whisper! - he was a major attention-getter who would do anything for pats and play time. And he had a million nicknames that attested to his demanding personality: His Royal Hineyness and Giant Sucktapuss, to name just two! I'm speaking in the past tense for a reason. Rascalbear was euthanized at age 17 only one month ago, after a long struggle with chronic kidney failure and metastatic cancer that did not respond to chemo. He was the love of my life as far as my many cats go. The pain of missing him cuts like a thousand desperate meows, and although I know I can never replace him, I would love to have another just like him. Or two! You're welcome to read more about Rascalbear on my personal web site at www.abbygeiger.com. I blogged about him a few times during his illness, and I only wish I had thought to do so sooner, because there's a jillion funny stories to tell. Slowly, I will write them as well. For those of you who still have them, hug your Siamese kitties and love them to bits! They truly are the awesomesauce of cats. Abby, I'm so sorry for your loss - our Siamese cats do burrow deep into our psyche and their departure, especially after an illness like Rascalbear's, is always so hard. I read your blog with a lump in my throat and tears in my eyes ... your pages about Rascalbear are beautifully written and I hope that you will write more about him over time. I'm so glad he was able to have his last little spell in the sun before he died. Thanks so much for sharing your story and pictures, and I hope that you will, in time, find another Siamese cat (or two) to take Rascalbear's place. Flame Points do seem to have a special character all of their own. New cats can never replace the previous ones, but they do bring their own special form of fun, love and energy into your life! Thank you, Anonymous. I waited 3 months and probably should've waited longer, but I now have two terrific 3-yr-old flame point siblings I wouldn't trade for the world. They took some getting used to, being unsocialized kittens that did not care to be petted or held. Talk about totally NOT Rascalbear replacements! Loved your tales about Rascalbear and his passing. I waited three years for my next cat and had a black cat for twelve before going back to Siamese. The reason? I did not want to burden a kitten with expectations to be like my first Siamese! Thanks, Gina. You remind me that I need to get some happy stories about Rascalbear out there, or at least put up some funny videos I have. I'm glad people are reading about him, but don't like to only make people sad. Pat your girls for me! Thanks for sharing your story about Rascalbear. I am so sorry for your loss. I've had my 2 Siamese girls for 3 yrs now and they have added so much fun to my life that reading your story of losing your Rascalbear made me feel so sad. I wish you the best in finding another flamepoint for your family. Thank you Candy. Any future flame-point Meezer will hear plenty about his forerunner, all while making sure he is never pressured to be a carbon copy. I am terribly sorry to hear you lost your li'l bab, I know how you feel, and although you can never replace your Rascal, you can tell the next li'l baby about their big brother. HUGS!!! It's the same old rumour all over the world with Siamese, people do not understand them so they get branded as anti-social and avoided. Frankly, I think that's a good thing because people who cannot understand how different Siamese are, do not deserve a Siamese for a companion. Most people want pets. 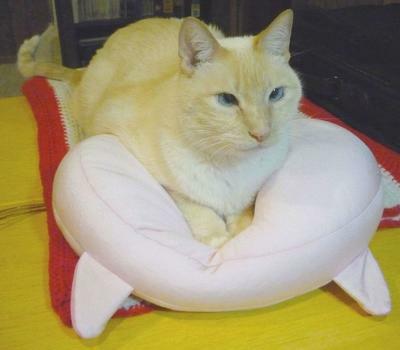 They get exactly that with ordinary cats, a Siamese needs someone who is prepared to spend time getting to know your new companion and understanding them, and they will (sometimes eventually) return all that input in spades. They will know and respond to all your moods, troubles and joys, but expect you to acknowledge that they have feelings too. They demand company and conversation, to be treated like the little humans that they are. Heaven help those that can't get their heads around that fact. Thank you, Clem and Gwyn. Rascalbear was the first/only Siamese I have ever had, and although I love all cats in general, I would like to try to make sure he is not the last. A nice story to read. Thank you for sharing. They are family and we will see them again when we pass to the other side. In our lives today and after. I'm so sorry to hear about poor Rascalbear. It is so hard losing what is so close to your heart. Another Siamese is out of the question to fill the gap left - until one comes along (usually out of the blue) and steals into your heart all over again - probably before you know it - and off you go on another roller-coaster love affair. Thank you Caroline, for posting Rascalbear's story. I'm glad you enjoyed the blog. One of the things we have done to memorialize Rascalbear was to purchase the domain rascalbear.com. It is here I will build a page full of stories, photos, and videos, and hopefully something useful and helpful with regards to my love of all things feline. I have much work ahead of me! Again, thank you so much for posting this! Return to Siamese Cat Memorials.